Years in the making, Derry sisters Noella and Jeanette Hutton have finally formed a band called ‘Blood’ and have just recorded an album with the same name. 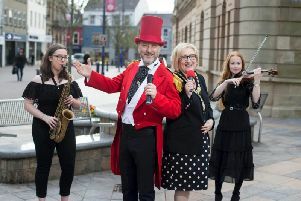 And to celebrate the local duo are holding an exciting launch with performances by Blood and support performances by John Deery in The Sandwich Co, Bishop Street, Derry on Saturday, December 8. Jeanette explained: “The formation of Blood has been a project of years in the making. My sister Noella and I have been involved in the music game for many years. Both of us began our musical careers at Primary School with choirs, folk groups etc. Both of us progressed to quite different musical careers. Noella as a very successful singer/songwriter and myself in a rock band. We may have had different musical tastes back then but we always shared the same love and passion for all kinds of music delivered from the heart..
“And so it came to pass that after many years of individual adventures across many parts of the world, we settled in Derry and figured it was time to get this done. We always believed that we couldn’t and shouldn’t ever push this.. when the time was right it would happen naturally and without fuss. “We started our project in the Summer of 2017. None of our writing days ever felt forced, they were usually made up of laughter, tears and a fair few cups of coffee and yarns..  We never really had a recipe, theme or concept. We both agreed to follow our hearts and see where it would take us… And, here we are. “We are two very proud souls who are overwhelmingly delighted that we have finished such a personal project. We are without a shadow of a doubt, very proud of our work both lyrically and musically. Each tune tells a very different story and will hopefully connect with the majority of people in terms of the stories told. We are both bursting with excitement at the prospect of sharing our album and watching this space to determine where it will take us. We’re well up for sharing it as far and wide as the Universe will allow.